In Black Horizon, a riveting and timely thriller drawn from tomorrow's headlines, New York Times bestselling author James Grippando brings back popular Miami criminal defense attorney Jack Swyteck in an international case involving a devastating oil spill that pits him against his most villainous adversaries yet.Three summers after the Deepwater Horizon catastrophe, oil is again spewing into the ocean - from a drilling explosion in Cuban waters sixty miles off the Florida Keys, creating a politically complex and volatile situation. Representing an American woman whose Cuban husband was killed on the rig, Jack finds himself in dangerous waters when he discovers that his incendiary case may be lethally connected to his new wife Andi's undercover assignment for the FBI . The first thing you should know about bestselling author James Grippando is that he is no longer clueless--so says his wife, Tiffany, after "A James Grippando Novel" was a clue for #38 Across in the New York Times crossword puzzle. 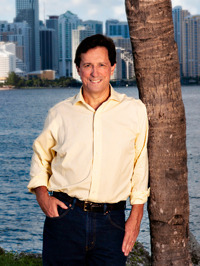 James is the New York Times bestselling author of 24 novels of suspense, including twelve in the popular series featuring Miami criminal defense attorney Jack Swyteck. His latest, "Gone Again," will be followed by the 13th novel in the Jack Swyteck seriew, "Most Dangerous Place" (Feb. 2017) . His first novella "The Penny Jumper" was published in October 2016. His novels are enjoyed worldwide in 28 languages. James's first job out of law school plunged him headlong into death penalty cases. That experience was an inspiration for his 1994 debut novel, The Pardon, a legal thriller that critics heralded as a "bona fide blockbuster." Beyond Suspicion (2002) was the long-awaited sequel to that first novel, and it launched an exciting series that features Miami criminal defense attorney Jack Swyteck and his irreverent sidekick, Theo Knight. James's writings also include "Leapholes" for young adults and numerous short stories. As a trial lawyer, James was an avid writer. His numerous scholarly articles appeared in some of nation's top law reviews, and they are frequently cited with approval by the courts. His trial practice ranged from complex corporate litigation to class actions on behalf of chicken farmers. As a frequent volunteer in Florida's guardian ad litem program, he helped provide legal representation to neglected children in family court proceedings. He was a faculty member with the National Institute of Trial Advocacy and an adjunct professor of trial advocacy at Nova Southeast University. He was named by Florida Trend Magazine as one of Florida's emerging leaders, and in 2006 he received the Distinguished Author Award from Scranton University. His alma mater is the University of Florida, where he graduated second in his undergraduate class and earned his law degree with honors. He now serves Of Counsel to David Boies' law firm, Boies Schiller & Flexner, LLP, where he specializes in entertainment and intellectual property law, representing clients who have won more than 30 Tony Awards.